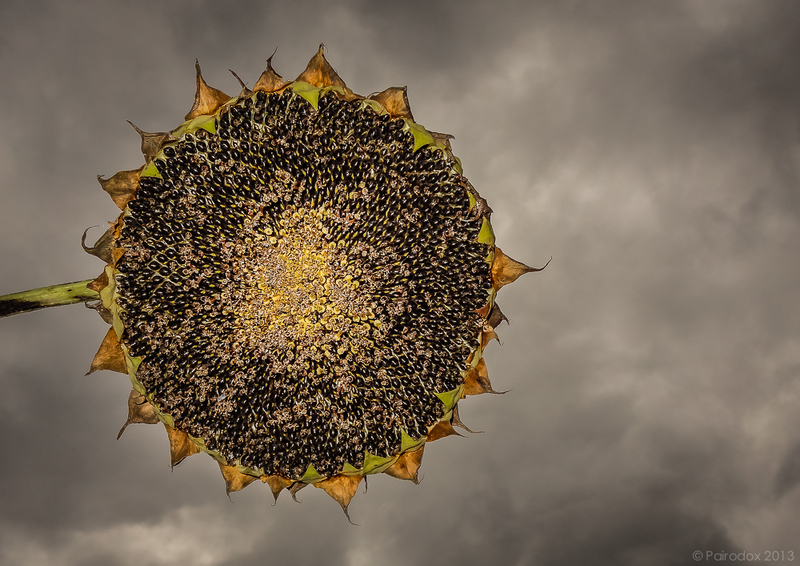 Toward the end of July I posted an image of a sunflower growing among many thousands of others in a field not far from here. If you saw it you may recall its color and vibrance. They say that Time Marches On. How true, especially if you grow things animal or vegetable. Shortly after capturing the image posted here (taken two days ago in the same field of sun flowers) I was surprised to find, in my WordPress reader, a post titled Before the Brown: Photo Series from a Moving Car posted at Play: Stories and Photos from the southern Saskatchewan Prairie. In this post M commented on the brief period between the time when crop plants have reached the fullness of their green, and harvest. I too am keenly aware of this respite and would admit that I believe nature’s pause to be all but audible as if the plants draw in a breath before their descent into autumn. In a similar way Joanna claims to be able to sense when plants take in volumes of water after a particularly long dry spell. Agricultural crops as well as plants which cover our surrounding hillsides grow rapidly, flower, set seed, pause, and then scenesce. In very much the same sense that the stars cycle in ways which can be predicted so to do all living things, yet on a very different time scale. In response to changes in the season our sheep are showing signs that breeding may soon be upon us. Birds are beginning to congregate; they are restless. Soon they will depart for ancient migration corridors to the south. I have noticed an increasing number of Woolly Bear caterpillars around the barn, a sure sign of the changing season. If you were to transport me to any particular time of the year I believe I could easily tell you to what month I had been transported. Joanna is much more attuned than I and would be able to tell you to which week she had been delivered. If this is no particular gift, then what would be our cues? There are many. The sheep. The pastures. The hay fields. The spring (from which we draw our water). The creek. The river. The trees. The deer. The soil. The birds. The feel of the air. The angle of the sun. Everything. All of nature reveals where in the cycle of the seasons you are on any particular day. Learn to read her … doing so is fundamental.